The room had been quiet before. It became still. I’m fortunate, because I don’t have to deal with this at cons. I know how to shut it down, but the bigger thing that saves me is that I’m “somebody.” Sexual harassment is, as much as anything else, a display of power over someone weaker. I was VP of SFWA. I’m an award winner. I have loud friends. I am not in a position where someone could sexually harass me and get away with it. This is not true for beginning writers. Back in 2010, while I was still VP of SFWA, I served as a conduit for a woman who had been sexually harassed by an editor to anonymously contact his employer. She didn’t feel safe doing so directly because she was afraid it would affect her career. You see that, right? The power that concern gave the editor over her? The publisher took it very seriously, and due to that the woman felt safe in speaking to a representative directly. Apparently, that doesn’t count as a formal complaint because it wasn’t to Human Resources or to the Legal Department. So, here we are in 2013 and Elise Matthesen was harassed by the same man at a convention. When she made a report, she was told it was the first one. She’s written up an account of her reaction and how to go about making a formal report of sexual harassment. Read on. Please. Let me add one thing to what Elise has said, and it’s what I told our students at Writing Excuses. If this happens to you, I will have your back. This will not stand. If someone needs me, I’ll be available. I never cared much for bullies. Thank you, Sigrid, for your support of Elise and the rest of the community in this. Thank you, Sigrid. And Elise. And everyone co-hosting these posts. Ditto the thanks for outing this guy. Warm kudos to Elise for stepping up and saying, loudly, that this is unacceptable. I, like Serge above, will stand by whomever needs to report these sorts of behavior. I, too, despise bullies. Seriously? One of the oldest and most senior editors at Tor? Oh, this is rich. I already had a low opinion of that man based on unpleasant interactions with him at various conventions, but this …. this just takes the cake. My respect for him is now zero, and I hope that anyone who’s been harassed by him comes out. They certainly have my support. He always skeeved me out as well, so I am unsurprised. I can’t believe one would be made to feel fearful during this process, or that the process should be so unnecessarily complex. It is a sad sign that we have a long way to go to fix the problem. Can I just suggest that you fix Elise’s name, which is “Matthesen”? I have been involved in this story from near the beginning (of it happening to Elise). I’m so glad to see it going public. Thanks to Elise for doing this, to you for posting it (and for having people’s back) and to Sigrid for naming names. I stand at the back of anyone who needs it on these issues. Whenever I hear about sexual harassment at cons it just freaks me the hell out and seriously makes me reconsider going. I mean, I’m a natural introvert so going to a con is already scary at this point at least because I basically know no one and the fact that some of these people are editors or other people with power in the community just makes it all the more scary. It’s still good that people are speaking out and reporting on these asshats. One thing that is true about cons, even introverts will find good people to have wonderful conversations. Most of us are also introverts, and the only place we shine is at cons. And the few that are Social Butterflies are gentle and good about getting us wall flowers to bloom. It is very supporting. Very few people are creeps. But, the world isn’t perfect. What is nice is because harassment is being talked about now, the conventions are putting in procedures to deal with it. I am on a con committee and we have even posted this article to our staff list to remind people of how to do things correctly. So if you do get bothered by anyone, talk to the party host, talk to con security, find a con staff member. Even if we are not the person who can deal directly with the problem, we know who can, and will get you connected. Con Security and Con Staff are usually well marked with special badges and/or Ribbons. We are there to help you. We want all cons to be welcoming places where even the most introvert person will feel safe. The bad-stuff-at-cons isn’t really worse than bad-stuff-all-over – it’s just that people are yelling this ain’t a private party no more, FIX IT. Other professional places that started off as, you know, professional places, don’t have this transition period. Cons that want to attract people have put harassment policies in place a la office harassement; cons that haven’t noticed that hey, people who aren’t geeky guys like cons too! may not have. Thank you Elise for this information, and for speaking out. 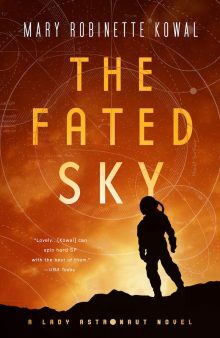 I was harrassed at a con party by an eminent author in my early twenties, which convinced me I’d have a hard time as a writer in genre fiction. It has taken me almost fifteen years to learn otherwise. I hope others come forward and the community continues to have our backs. Mary, that talk you gave us at the Writing Excuses Retreat was not one of my favorite parts of the week. But looking back it was possibly one of the most important and – yes – reassuring. I don’t want to hear that I have to worry about sexual harassment at cons. That’s supposed to be my special fun geek-culture place. I don’t want to worry about bringing my daughter along with me as she gets older. But I also don’t want to be blindsided by it. You speaking up about the issue, and Brandon/Dan/Howard all supporting, gave me confidence that it’s an issue that good people take seriously. That this isn’t something that’s going to go away overnight but that there are people who have my back should something happen. I wish you had been recording that talk. I wish you’d do a whole Writing Excuses just on that because it’s something people need to hear. Thank you and all the other signal boosters for getting this out there. It means your words to us that night were real and honest and not just hot air. It still makes me sad this is a problem, but I’m glad to have good people talking about how to fix it. Thanks for writing this post. We’re in the thick of it, these days, and the harassers and misogynists are being spotlighted, as they should be, and the people are speaking up. I’m delighted to help in this process, to make these cons a place where we can attend safely, without fear, among our people. These are my people. Shame on them that bully. Thank you for posting this. That point about names and formal records is particularly important, something many won’t have thought of. Thanks to Mary and everyone who’s putting this out there. And for Elise, and foranyone, although I’m not often at conventions of late, I am there if I am needed. And I don’t need to ask Stu (Shiffman) (though I will later) to know I can say that, we too, have your back. We can be Fair Witnesses. We are friends. We stand (and sit) with you and with anyone who needs support. Conventions have been the source of great joy, laughter, conversation, friendship for so many wonderful people. I will fight however I’m needed to keep them that way..
Another aspect to keep in mind about reporting harassment, as I’ve learned the hard way, is that some states have statutes of limitation on the time you have to report. For example, in Connecticut, if you don’t report the harassment, formally, within 90 days of it ending, then no action can be taken. As I said, I learned this the hard way when I didn’t report my own experiences with being harassed (in a work, not conference setting) for more than a year because it took me that long to get up the nerve. Then, when I did, the delay was actually used against me, rather than for me, by those in power. Thanks to Elise for having the courage to share with us how harassment should be reported. When I was in my 20s, I was sexually harassed at a conference, and I was too young and naive to know what was what, too inexperienced to realize I was not at fault, and for years I felt ashamed as well as soiled. After I wised up a bit, in my 30s, I learned how to speak up for myself, how to feel proud of who I am, and how to stand for other women when they’re in need of bolstering. I’m in my 60s now and not a part of the SF writing community, but I offer my whole-hearted support to Elise all the same. I also want to say to Mary: you did the right thing, naming names. I’m a senior HR executive in a large company. We take sexual and other harassment reports seriously for several reasons. First, there can be legal ramifications if a company ignores harassment complaints. Also if a company gets a reputation for even passively allowing harassment then prospective employees and customers may look elsewhere. Finally, harassment makes for an unpleasant work environment with adverse effects on productivity. Or to put it less formally, a competent HR department gives a damn about your complaints and will try to stop harassment. Wow. I’d like to say I’m surprised, but I’m anything but. Thank you for being brave and for speaking up. The more we speak up, the easier it will be for others. 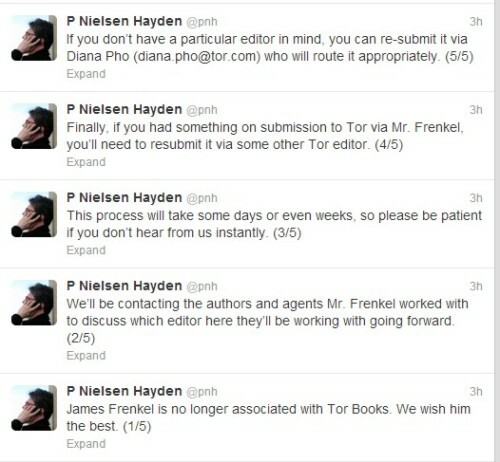 Without knowing WHAT Frenkel did, it really takes away from the article for me. Wouldn’t it be better to point what was wrong, so anyone else out there who might think that behavior is okay learns a lesson and sharpens up? Or is this a case of what he did most people wouldn’t find objectionable? This post isn’t about what Jim Frenkel did or didn’t do. It’s about how to report harassment. Touche… But reporting sexual harassment requires you know what it is. Sorry for the curiosity. If you’ve been harassed, you’ll presumably know. Thank you for hosting this, Mary, and thank you to Elise for stepping up and sharing her experience. It did not even occur to me to ask if they wanted to report the incident. We’ve been talking about this for a long time. I’ve heard all the nightmare stories from years past, and still, in the moment where it mattered, the idea of filing a report, or of offering to support them in contacting the con staff, did not even enter my head. I feel like an idiot in retrospect. So thank you, Mary and Elise, for helping to ensure that next time, I will be better prepared to take action.